This is a semi-homemade meal that college students or people starting to make Indian-inspired meals can easily make with just four ingredients from the Indian store. 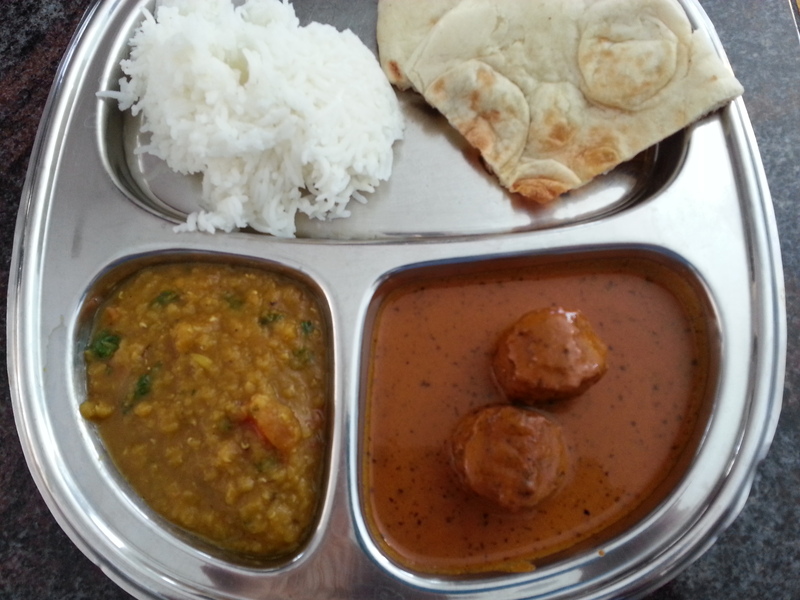 So, on the menu tonight: naan, dal, vegetable meatballs in a kofta curry-like sauce (mini meatballs or turkey meatballs work well, too), and white rice. 1. Frozen naan bread. They generally come 4 or 5 in a package. You can get plain or in different flavors. 2. 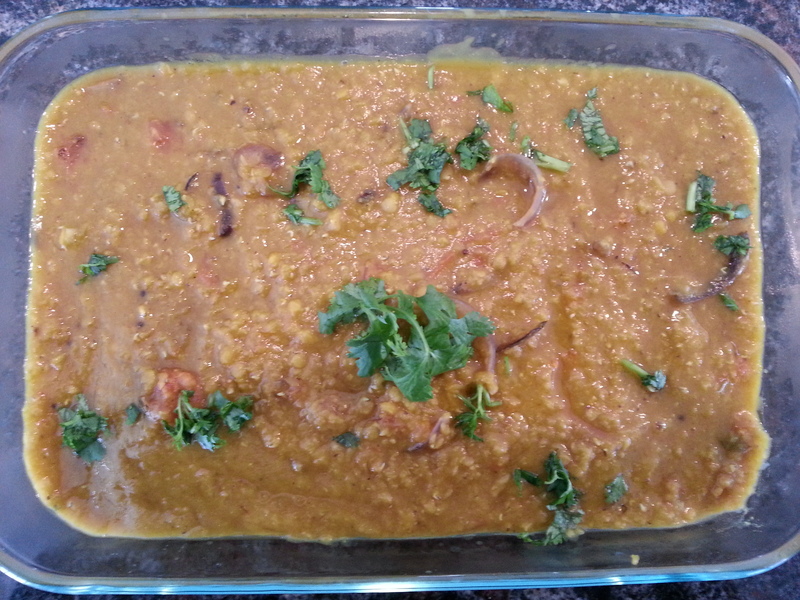 Masoor Dal – husked red lentils, either whole or split. It’s also available in many grocery stores in 1- or 2-pound bags, in the aisle with dried beans. Usually toovar dal is used for instead of masoor dal, but it takes longer to cook, or needs a pressure cooker. 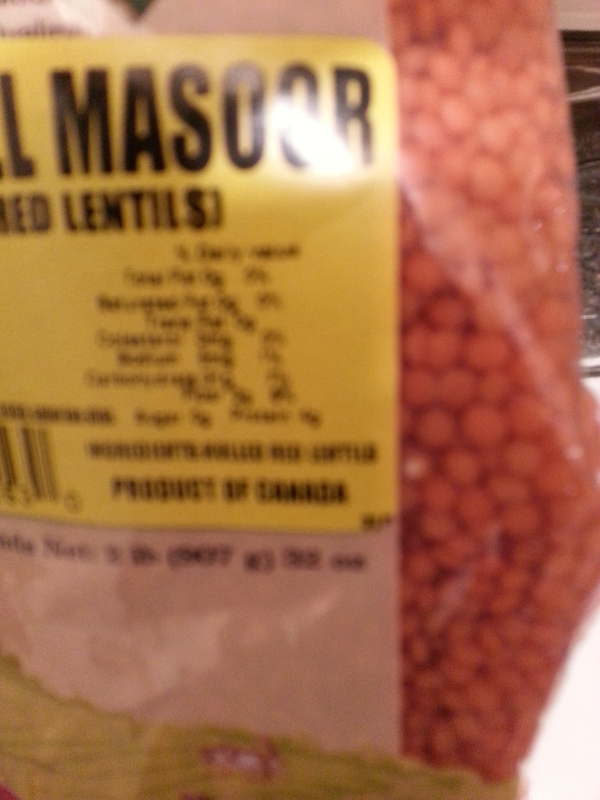 Masoor dal cooks quickly and can be used to make yummy soups too! 3. 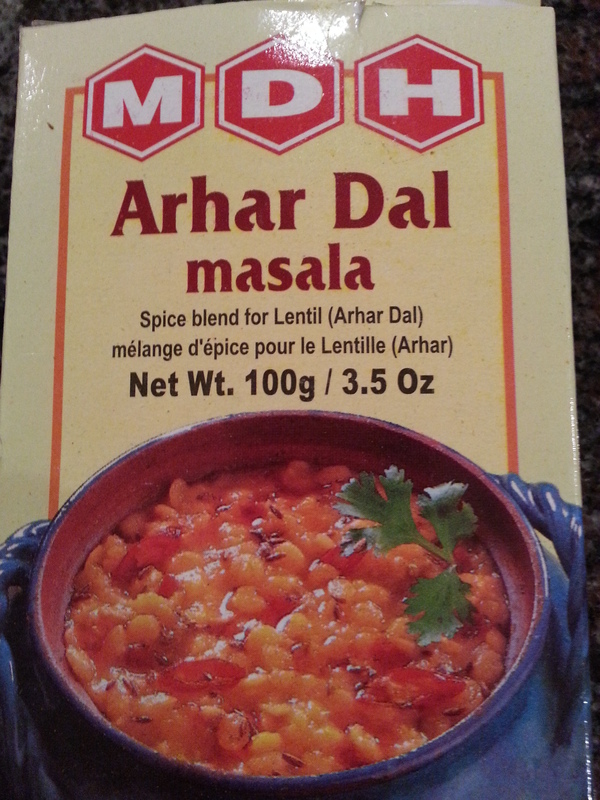 Dal masala, such as MDH Arhar Dal Masala. I like this brand because it has all the tempering spices you need already in it. Plus it’s not too hot (spicy). The whole dinner takes about 30 minutes to make, if you make the meatball curry while the dal and rice are cooking. 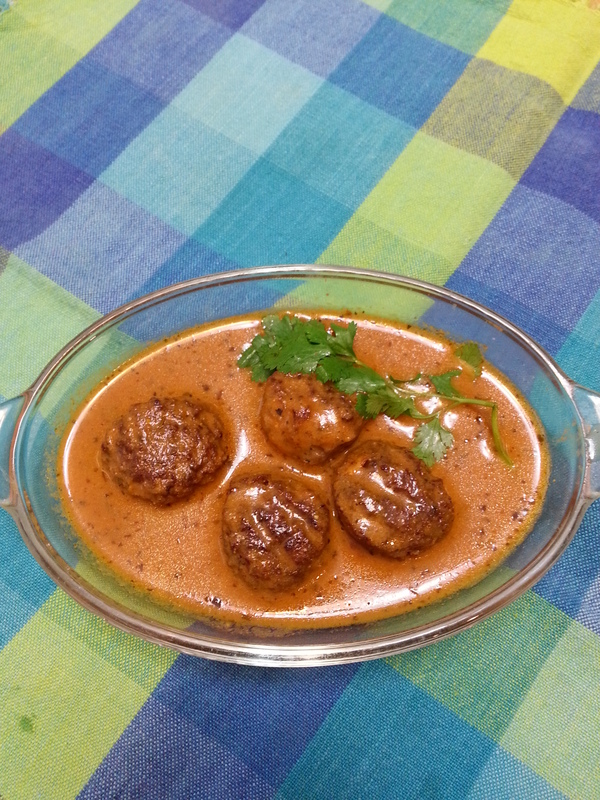 So I would get the dal and rice cooking, then start the meatball curry dish. Finish making the dal, put together the curry dish, and warm the naan as you set the table! Yum! Combine the washed dal and water in a 2 quart pan, and heat until the water comes to a boil. Stir the dal, and turn heat to medium. Cover the pan, and let cook until the dal is fully cooked, about 12 minutes. The dal turns yellow when cooked. Add the dal masala and ½ cup water, stir, and set aside. In a small frying pan, heat the 2 teaspoons of oil, and add the sliced onion and stir fry it for a minute. Add the tomato, and stir fry for another minute. Add this mixture to the dal. Stir in the lemon juice, salt, and sugar (if using), and let it simmer for a few minutes to assimilate the flavors! You can add chopped garlic, spinach leaves, or cauliflower florets to the onion and tomato mixture, and add it all to the dal. This dal freezes well if you want to make an extra batch! When reheating, add some water if the dal is too thick. Basmati rice tastes yummy with this meal. To make the rice, wash the rice using several changes of water. Then, if using an electric rice cooker or microwave, combine 1 cup rice and 2 cups water and cook according to the directions of the rice cooker or microwave manual. If cooking the rice on the stove top, let 1 cup rice and 2 cups water come to a boil, then turn the heat down to low and cover partially. Let the rice cook for about 14 minutes. I use veggie meatballs – such as Morning Star (about 15 in a package) or Trader Joe’s meatless meatballs, found in the freezer section of the store. Turkey meatballs or mini-appetizer meatballs work well for this recipe, too. Defrost the veggie meatballs in the microwave for about 1 minute (time will vary according to the microwave) and set aside. Heat a medium-sized frying pan on medium heat. Add 2 teaspoons of canola or olive oil and add the meatballs. Let them cook for about two minutes, turning them so they are crispy on all sides, but not burnt. Remove the veggie meatballs and set them aside. 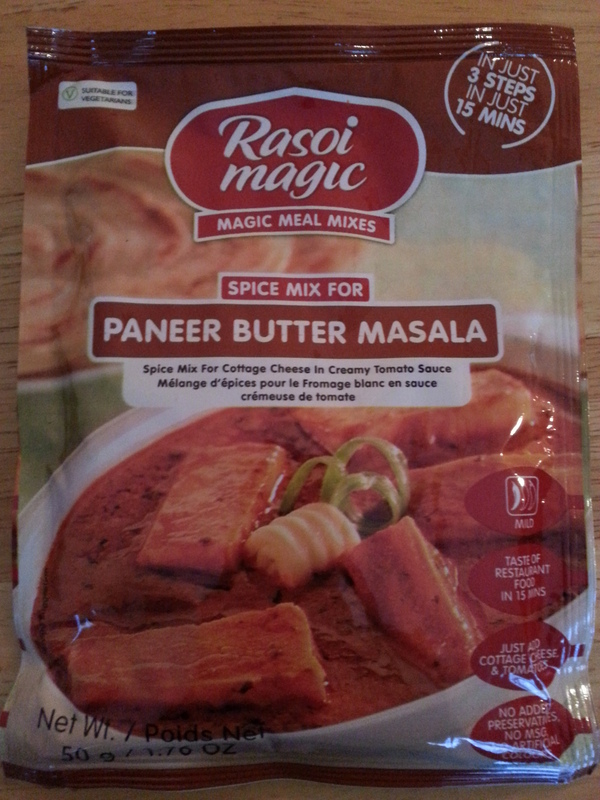 Make the sauce by stirring together the Rasoi Magic spice packet with 1 cup milk in bowl. Set aside. Heat the same frying pan used for the veggie meatballs. Add 1 tablespoon of oil and 1 tablespoon butter. Add the tomato paste and stir until fragrant, about 1 minute. Add the curry spice and milk mixture, stir to combine with the tomato paste, and add the sugar and water. Stir, cover, and let the curry cook on low for about 5 minutes, stirring once or twice in between. Uncover, stir in the meatballs, and cook on low for an additional 2 minutes. Stir in the cream and remove from heat. Do not boil the curry after adding the cream. Serve with naan, dal, and white rice. 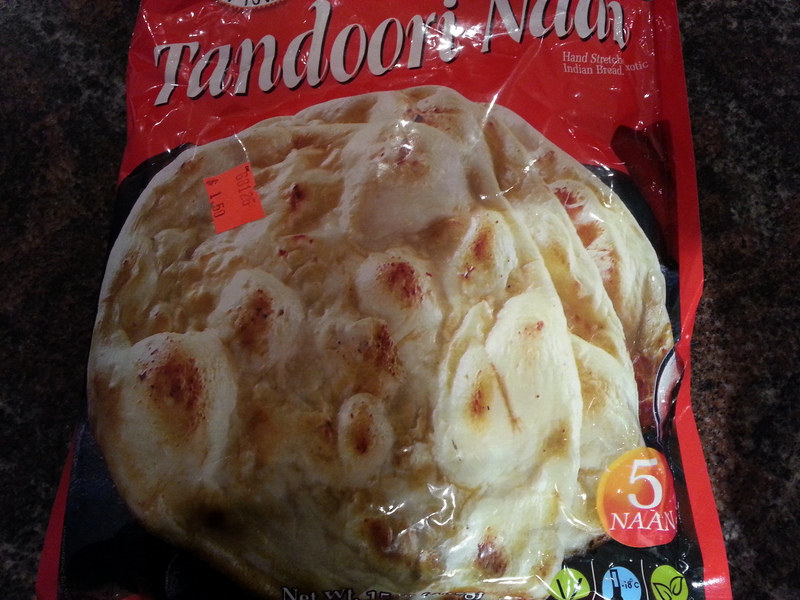 Heat the naan per package instructions and your dinner is ready! With the same curry, you can make vegetable korma by stir-frying defrosted mixed vegetables (such as carrots, peas, and corn) and adding them to the curry. Fried paneer (cheese available in Indian stores) can be added to this curry to make paneer masala. Curry can be made ahead of time and reheats well.